Garage sale finds were good this weekend. I am so glad the 'season' is back. I am always on the watch for wooden spools, cast iron and kitchen vintage. I also scored a new to me weed eater that I can handle. I did the edges of everything in the back yard and when DGS (did I mention he is 8 1/2 years old !!!) arrived he volunteered to mow the grass. He puts his best efforts and planning in to mowing - he plans his moves, likes long straight parallel lines and manages the lawnmower very well (yes he was very closely monitored by his Dad). It goes almost without saying that Grandma is VERY impressed. Peaches gnawed on her bone and watched from a safe distance. Hooray for your precocious GS! You finds some great pieces! I love the cast iron. Oh and Peaches is just precious!! 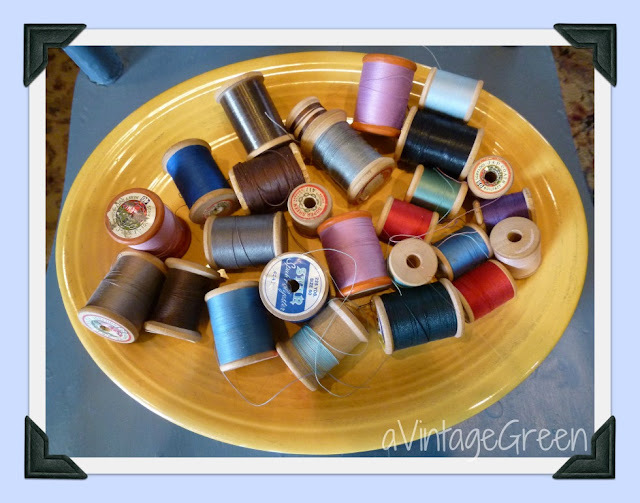 I look for, find and buy wooden spools all the time....then I don't know what to do with them!!!! But I'll still be looking for them next time!!! Oh wow I love those cast iron finds... very cool! And the scale is awesome, too! Great finds thanks for sharing! You DS is having fun as he learns. Sounds like he is taking his time and planning his moves, that will serve him well throughout his life. I love how you frames all your photos. I need to find a program that I like. 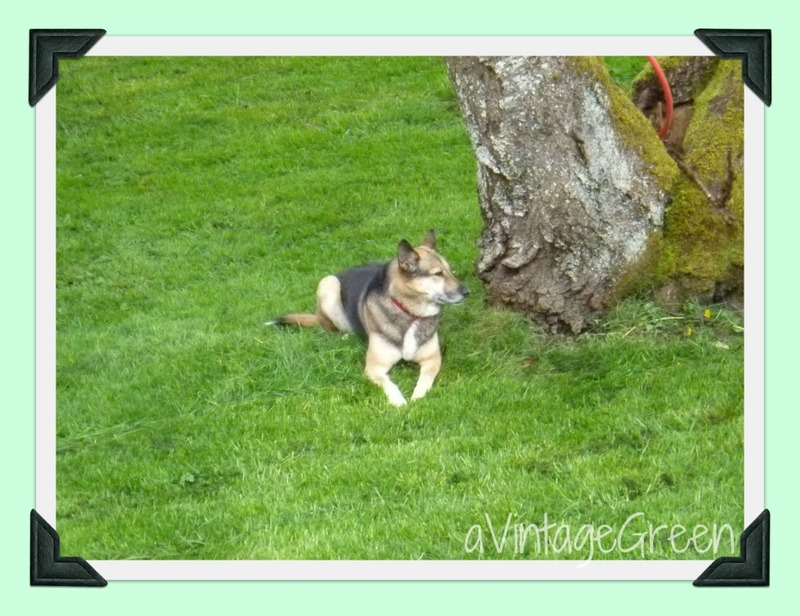 Love your blog this Vintage Thingie Thursday. 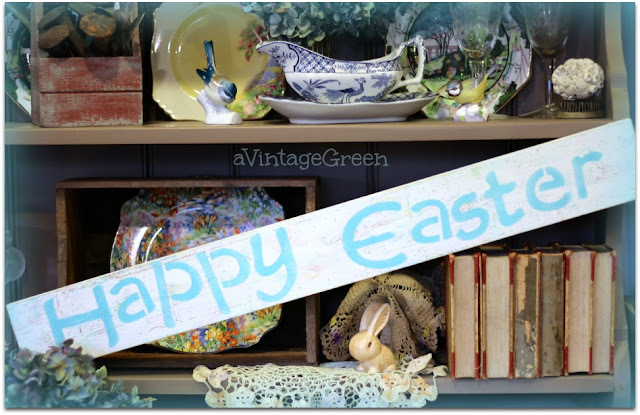 Great images and right with you on being happy for the return of Yard Sale Season. You found some great items. 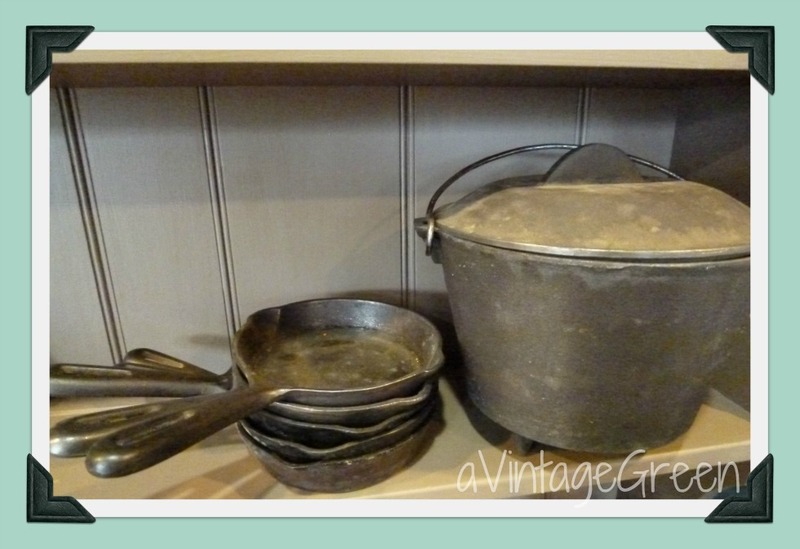 I also love collecting vintage kitchen ware. I always weed eat our lawn. Everytime hubby tries he butchers it. Wonder if he does it on purpose? lol! Great to know there is another weed eating woman out there. Sound like your little grandson is a keeper. So nice to have him help you out. Thanks for sharing this with Share Your Cup Thursday. 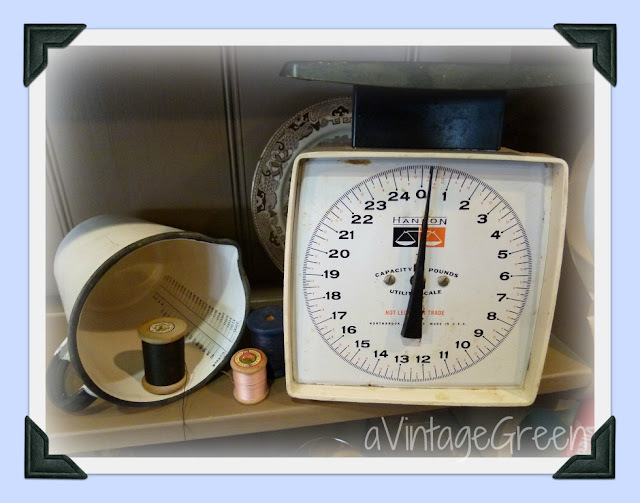 great finds Joy ... love the scale and wooden spools are so nice to have. I love the season, too! You made some great finds, I've been wanting a good cast iron pot for cooking beans. My Mama's made the BEST!! I'll have to come thrifting with you! Great finds! I love the cast iron pieces and the spools. I love all your vintage finds. I'm ready for a good hunt. I am your most recent follower. Hope you'll drop by for a visit and follow me too. I love all my new foundfriends in blogland. So much inspiratio here! Love all your new treasures! Thanks for sharing on Simple & Sweet Fridays.